Here's the last of the competitors from the LA Cupcake Challenge! Comment: All of their cupcakes are cocktail-infused. Comment: Recognize this woman? She was on the pilot of The Food Network's Cupcake Wars a few months ago. I felt like I was meeting a celebrity! Loved the frosting on these cupcakes. Comment: These cucpakes were made by the pastry chefs at Tavern Restaurant in LA. They were beautifully presented. Comment: The chocolate ganache on top of the red velvet was a nice twist from the usual. The frosting was a good consistency on both cupcakes. Comment: The Chocolate Covered Strawberry was one of my favorites. Reminded me of a strawberry cream See's chocolate, with chocolate cake attached. I also thought their booth was well put together, with a fun theme. Comment: Apples are one of my favorite foods. It's always fun to see them in cupcakes, which doesn't happen very often. Good combo of flavors. More importantly, did you see who won? Find the results of the LA Cupcake Challenge here. You think you've seen a lot of cupcakes already, well, I'm only half-way through. This next set of competitors had some pretty unique cupcake flavors. Comment: This isn't the actual Breakfast Cake, but it is a good representation. It was a buttermilk cupcake with bits of bacon, topped with maple syrup frosting and more bacon bits. I actually took one home and had for breakfast the next morning. Yum! Comment: There was no way I was going to like a pistachio cupcake. Polkatots proved me wrong...it was great! Also found out that Polkatots specializes in cupcake cakes. (Sadly, their cupcakes were gone before I got a picture) Last year they won 1st place for Best Original and Best Overall cupcake at the LA Cupcake Challenge. Comment: I'm assuming these cupcakes are made by the restaurant at the hotel where the event was held. Nothing special. Comment: Last week they sent out a coupon to get 6 cupcakes for $8. They said they sold 1400 cupcakes last week! Last year they won 3rd place for Best Original in the LA Cupcake Challenge. Comment: These two cupcake flavors reminded me of my favorite soaps. I've never had cupcakes with rose petal and lavender before. One of the most fun parts of the day was getting to meet some of my blog readers. 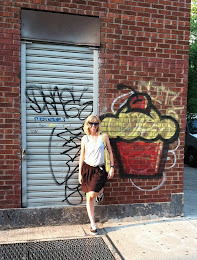 At first I was surprised that anyone recognized me, then we became instant friends as we shared our love for cupcakes. I made an effort to talk to all of the owners. I loved seeing how passionate each of them were about their cupcakes. It's that kind of passion that will push owners to create amazing cupcakes. Check out the first group of competitors here. Check out the second group of competitors here. See the final results of the LA Cupcake Challenge here. 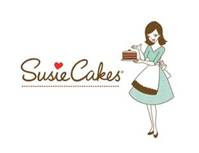 Starting April 5 and continuing through the month of April, SusieCake will be giving out free cupcakes to kids 12 and younger who wear their sports uniform into the bakery. The kids will be able to pick their favorite frosting-filled cupcake, which they can top with a sports-themed decoration. 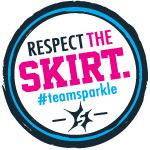 According to the press release, founder and owner Sarah Sarich said, "I hope this is something both little sports stars and parents alike can look forward to as a fun, rewarding post-game activity." I'll use any excuse to visit SusieCakes. Comment: Frosting tasted exactly like the frosting you would find on a wedding cake, possibly French buttercream. Comment: The caramel in the middle and the caramelized banana on top were perfect touches. Comment: These cupcakes were infused with gourmet tea. Comment: Meringue had some unique, delicious flavors. Pretty Woman was a champagne cupcake and Pigs on Tap was a Guiness and bacon cupcake. Did you already check out the first group of competitors? Find them here. What exactly is the LA Cupcake Challenge? Find out here. 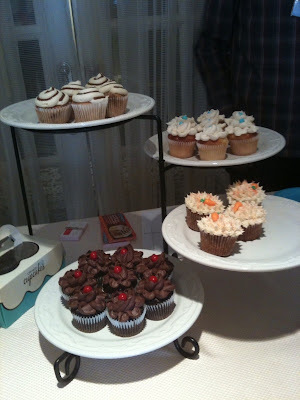 I was blown away by Blue Cupcake's cupcakes! I am a sucker for cupcakes with filling (caramel in the Vanilla and pumpkin mousse in the Pumpkin). I loved the sweet and salty combination that both of them had (salted vanilla buttercream on the Vanilla and pumpkin seeds on the Pumpkin). Blue Cupcake also had a very cute display. Congratulations to them for their 2nd place win on Best Traditional. Big Man Bakes had some of the moistest cupcakes I've ever tasted. The "Big Man" told me that he worked for months perfecting his Red Velvet before he began selling it. He didn't want to sell an inferior cupcake. I admire that. Fairy Cakes was a close second place for me. Not sure why the two pumpkin cupcakes were my favorite of the day, but both were done just right. Fairy Cakes' Pumpkin cupcake was the first one I tried that day and was one of the few I was still thinking about after I left. 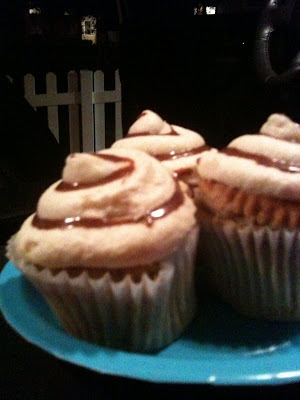 I've read a few blogs over the past couple of days proclaiming their loved for Fairy Cakes' Pumpkin cupcake also. Great job! 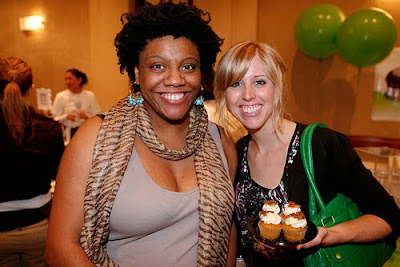 You can find more photos on the LA Cupcake Challenge flickr pool. 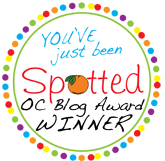 My friend Kelly attended a mommy blogger event over the weekend. I was super excited to see her tweeting about the new Cinnabon cupcakes. I was even more excited when she saved one for me to try. After getting mixed reviews on them, I was curious, but a little hesitant to try one. Kelly brought me the Cinnacake Classic cupcake, the one I thought would be the best anyway. I took a bite and am happy to report that it was tasty! BUT, I must say that I wouldn't really call it a cupcake. It is more of a hybrid between a cinnamon roll and cupcake. Whatever you want to call it, make sure you try one yourself.